With Photon you can display and launch games from any platform and distribution system in a sleek and beautiful interface. 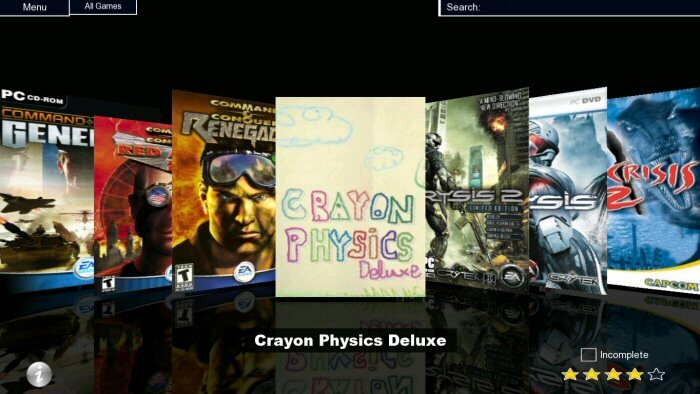 Photon comes with several different interfaces to make you game collection look amazing. Including a replacement for Games Explorer and a stunning full-screen interface. With automatic game searching and artwork downloading features, all the hard work of managing your game collection is done for you. Why not try Photon today and see what you are missing? 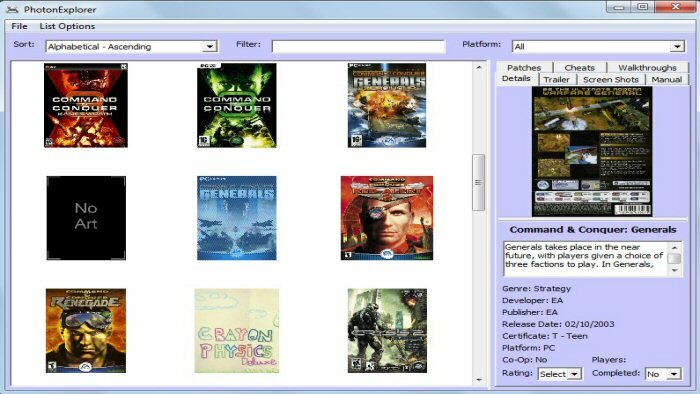 Photon is an advanced game launcher and the product of many years hard work by Thomas Preece. 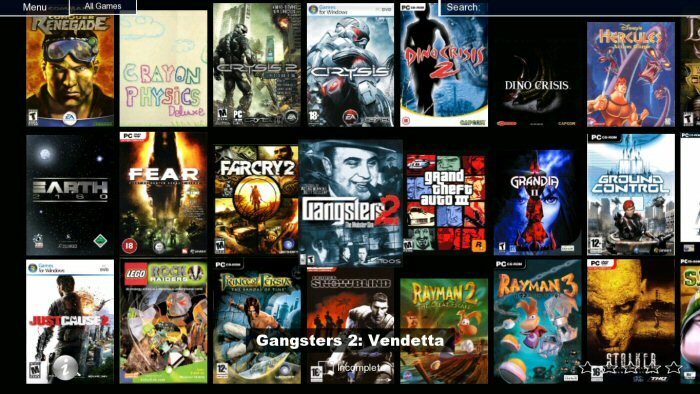 It focuses on making your game collection look amazing and is designed to automate the process of downloading game art, game info, official patches, cheats, manuals and walkthroughs. It also has many gaming related features to make your life easier and to get the most out of your games. Photon has 3 main parts. The first is a advanced configuration app that manages your game collection and features automated game searching and automatic Steam and Game Explorer import functions. The second is an immersive full-screen interface that really makes your game collection look beautiful. The final part is a windowed interface that was designed as a replacement for Windows Games Explorer but ended up being vastly superior to Games Explorer and equally as stunning as the full-screen interface. No longer will you have to open up your game cupboard and load up steam, origin and any other distribution systems to see what games you own. With Photon you can keep all your games in one place by adding games from any distribution system and any gaming platform including games consoles such as the Gamecube and PS2. Owning games isn't just about playing them. Show them off to your friends in the two gorgeous interfaces provided with Photon. The first is an immersive full-screen interface that really makes your collection look amazing and the second is a windowed interface that is a vastly superior to Windows Games Explorer. Both interfaces are highly customisable allowing you to make your collection look both unique and stunning. Photon isn't just about making your games look good, it's about launching and playing those games too. And with a large amount of features in Photon focused around launching and playing games you will find it even easier to get the most out of your games. 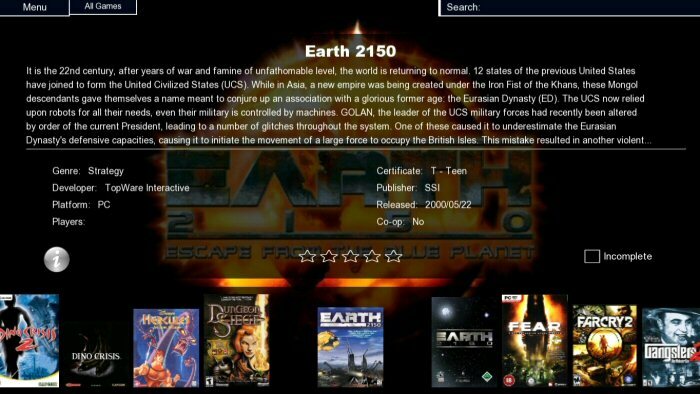 With built in support for online databases you can access a huge array of game information and artwork with ease. 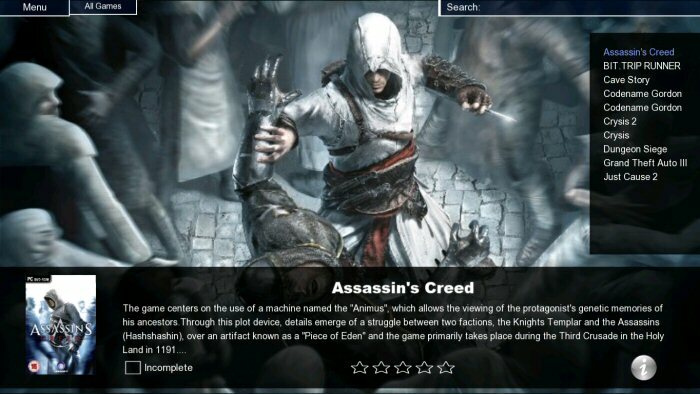 In particular our good friends over at thegamesdb.net have over 26,000 different game's information and artwork so you'll find it very hard to not automatically get your games information and dazzling artwork. We want you to be able to use Photon no matter what input device you are using. At present we support touch screen control for devices such as Windows Surface tablets, controller and joystick support including Xbox 360 controllers and many others and your typical Mouse and Keyboard for those traditional PC gamers. Different input devices also have different menus (and on screen keyboards) to make it easier to navigate no matter what input device you are using. 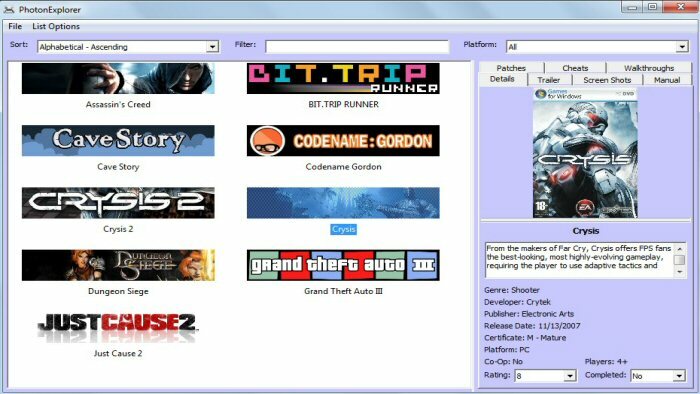 Connecting to online databases, Photon can find and download updates for your old games, manuals, cheats and walkthroughs. We know how much you loved your Sega Genesis and N64 that are now sitting in the attic. Photon supports emulators straight out the box allowing you to further unify your game collection and play those old classics of your childhood. You can find the most up to date version of Photon below. It is free to use with a database of 5 games or less and is a fully featured version of Photon other than that one restriction. If you wish to remove that restriction you will need to support me by buying a license key. 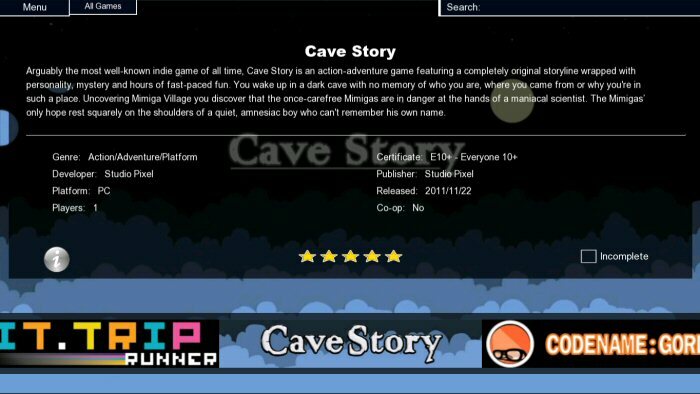 As this download is the full featured version other than that one restriction, you can use it to try before you buy. As much as I love programming Photon it doesn't pay the bills. By paying for a license key not only do you get an excellent product but you also help me to continue developing Photon, be that with new features, bug fixes, or improving the current feature set. Also as an owner of a license key you will get lifetime customer support and updates for Photon so any new updates for Photon will instantly be available for you to download and install. Using PayPal allows us to make sure our customers are safe and secure when paying. You also do not need to have or create a PayPal account to pay so it is easy too. As a result we do not store any of your details on our servers so you can be confident that your details will stay safe. A license key comes with lifetime support and updates. There will not likely be a V5 (and even if I do release V5/V6/V7/etc, your license key will activate it and give you full support and updates). We mainly offer our customers support via email but you can also get support and information from our Facebook page, bug tracker, FAQs page and in the guides we have produced. I have been developing this project over many years and over those years I have gone through a few complete code rewrites which I signified by changing version number of the software. If you would like to download one of these old versions please see the link below. Different countries have different laws regarding emulators and their legality so I do not accept any responsible for any illegal activities committed by use of emulators by yourself or anyone else. If it is illegal in your country DO NOT use Photon with emulators. The Linux version currently doesn't support all of the features listed in the Features section and you may experience crashes and bugs.